The jurisdiction for Vegas Casino is Malta with a license from Curacao. VegasCasino is owned by Redcorp SA and operated by Azurolongo NV (the same company that runs 7Red Casino). New Zealand gamblers are welcome, but Australia, United Kingdom and United States gamblers are not. The primary currencies supported are € (Euro), Norwegian Krone (NOK) or BitCoin (BTC). So let’s be honest about the focus of this casino. They seem to be interested in gamblers, who love the glitter of Las Vegas, but don’t want to visit the United States to get this spark. That is the beauty of the World Wide Web. You can enjoy the top brands from around the world in the convenience of your New Zealand home. VegasCasino was established in 2016, so you will find some of the most modern games on the website. In terms of New Zealand Dollars (NZD), the minimum deposit is about NZD$10. Compared to real money online gambling industry norms, these minimums are very low. VegasCasino is aimed at every man. Anyone can play. The VegasCasino layout looks like a brand new car with a rich and crisp look and feel. The website has a black background on which the features and games are displayed. It tries to mirror the sights and sounds of the Las Vegas strip. What do people love about Las Vegas, United States? They love the action and high energy. Until recently, it was the only large metropolitan area in the US that had legalized gambling. Vegas was like you were in a dream land. You could see casinos with Paris, Egyptian or Chinese themes. The VegasCasino website tries to replicate this online. There are numerous slots to choose from. The registration process is fairly simple. The website understands that visitors want to choose from a wide variety of games and that is what they offer. On the left hand side of the Home page, there is a display of the Latest Casino Winners. This is always beneficial because it makes the website feel more real; for beginners, you can also see which games are the most popular. Visitors can get a Welcome Bonus on their first three deposits. That is pretty nice, some online casinos only reward you for the first deposit. Vegas Casino appreciates and rewards daily gamblers with frequent bonuses. There is a Daily Bonus every day. This is great for daily gamblers. Housewives can play whenever they want. There is even a Happy Hour Bonus every Wednesday between 17:00 – 19:00 CET (Central European Time). Central European Time is British, Norwegian and Swedish time. You can also look for promotions on specific games. For example, you can get 20 free spins on Penguin City and 200% up to 200 Euros, which is NZD$336.10. That is surely a nice incentive for those who play a lot. What many customers like is that there is no wagering requirement for bonuses. You don’t have to gamble a certain amount every month to qualify for the bonuses. You are not a slave to this website, play when you like. An estimated 84% of New Zealand citizens own smart phones. Smart phones have become like a second hand. You can download VegasCasino apps for your Android, iPhone or iPad. This mobile casino can be accessed 24/7/365. If you have a lunch break, play some slots. You never have to be bored again. Vegas Casino is ideal for New Zealand gamblers. New Zealand is sort of a mixture of Anglo and Asian cultures. The Vegas Casino seems like the ideal solution for Kiwi gamblers. If offers you games from both East and West, along with customer service in English. You can choose from hundreds of games. Some might be added or removed, but at last count there were 422 games. If you get bored with one game, try another. There are different game developers on Vegas Casino. This ensures that you have the most popular games on this Web-based instant play platform. 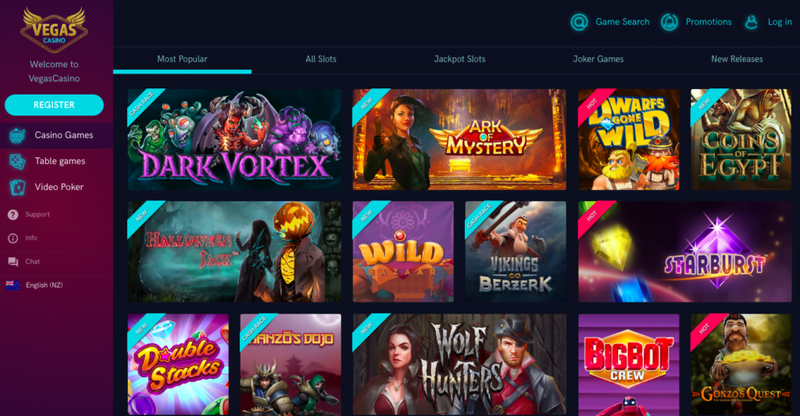 Video Slot games include Penguin City, Sizzling Spins, Hanzos Dojo, Legacy of Egypt, Aliens, Attraction, Oily Business, Mr. Vegas, Fruit Zen, 4 Seasons, Aloha Cluster Pays, Mega Fortune and Trolls Bridge. The company might add or remove games based on their popularity. You can also choose from Progressive Jackpots, such as Chase the Cheese, Enchanted Crystals, At the Copa and others. There are also plenty of table games, including baccarat, roulette, bingo, Pai Gow Poker, casino hold’em and blackjack. Moreover, the blackjack games are broken down even more into American, Super 7, Single Deck or European VIP. This is an international casino gaming brand. The Video Poker selections include All American Muli-Hand, All American Progressive, Bonus Poker, Bonus Poker Deluxe Multi-Hand, Bonus Poker – Multi-Hand, Deuces & Joker Poker – Multi-Hand, Deuces Wild, Double Joker, Tens or Better, Pyramid Joker – Jacks or Better and others. You can play scratch cards. VegasCasino also includes live dealer games. Gamblers have a good selection of digital monetary systems at Vegas Casino. You can use some of the following for deposit only. These are the banking options for deposit: Maestro, MasterCard, Visa, PaySafeCard, Neteller, CASHlib, Skrill-Moneybookers, Instant Bank, ecoPayz, Bitcoin or Direct Bank Transfer. These are the only withdrawal options, including Visa, Neteller, Skrill-Moneybookers and Direct Bank Transfer. Withdrawal takes a little longer than most would hope for. The good news is that you can withdraw to your eWallet in about 3 days. Some online casinos do not offer eWallets yet. Credit cards or bank transfers will take 3 to 5 business days to complete. If your winnings are higher than NZD$8402.39, then you might be only able to receive your payments through installments. That is a bit of a negative, but understandable. Each has its own point earning system – cash back opportunities. For instance, Silver VIPs receive 10% cash back, while Red Diamond VIPS receive 30% cash back. Customer support languages are English, Finnish, Norwegian and Swedish. Gamblers can choose from phone, email, instant messaging or Live Chat with the customer service representatives. Unfortunately, the casino support hours are not ideal for New Zealanders. Our New Zealand time is called UTC+13 (Universal Time) and the customer support for Vegas Casino is CET (Central European Time), which has a difference about 12 hours. Basically, we are 12 hours before them. The website might be managed by Scandinavians based on these customer support hours and currencies accepted. You are unlikely to get bored when you play all of the games that are available on VegasCasino – www.vegascasino.com – have some fun. The money deposit and withdrawal options are modern, including the top credit cards, money transfer systems and even Bitcoin. There are numerous bonuses to keep New Zealand gamblers well-entertained. This Vegas Casino review found some of the most up-to-date popular video slots available. It is nice because you can choose from games from different vendors. You don’t need to fly to Las Vegas, Nevada, United States of America when you have your own VegasCasino – www.vegascasino.com – so enjoy yourself.